Old enemies return! A new legendary power is unleashed! A dream team is formed! 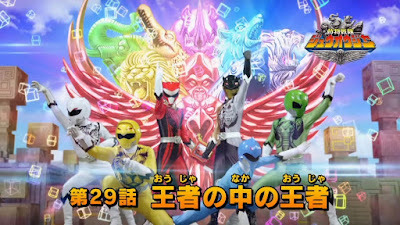 And this can only be witnessed in the 29th episode of Zyuohger which will also celebrate the 2000th episode of the Super Sentai series! Enjoy the clips after the break! "Do not understimate Super Sentai!" "Ending the party with a big bang!" Happy that this team-up happened? Then drop us some of your thoughts down the comment sections below and let's continue celebrating the Super Sentai franchise's anniversary party! Except for how he's set to appear again in the Super Sentai special with the "Dream Sentai". luka looks even more beautiful now than 5 years ago.....i wish this was a 3 parter so the rest of the gokaiger crew would have more screen time. maybe if we are lucky they'll have a special like dekaranger is about to have with gavan. i know many are not fans of gokaiger cause the shifting into other heroes gimmick helps them, but honestly i'd love to see a special where it's just the gokaiger without the gokai change/keys available. the gokaiger powers are fun in their own right, and the characters are very fleshed out and unique. This episode was great, but I still enjoyed the previous one a bit more. * Another stupid all red Gokai Change. They did it so much during their series and movies that it's wow factor wore off a long time ago. By the way, the ladies using MagiRed and GekiRed again? All blue and all pink barely appeared and that still gets me salty. * No GokaiOh despite of the fact that the Galleon appeared. * It's plot had so much potential it could be more developed in a movie, using the extended time to create more moments of character interaction and development, like in previous VS. movies (Magiranger vs Dekaranger comes to mind as one of the best examples). * How the hell Wild Tousai King can use RangerKeys and Ultimate Powers?